Sweet, Spicy and Herbed Nuts. Baked goods are everywhere… It’s totally driving me nuts! Sorry! I just couldn’t help it. Let’s change things up and get away from the sweets for a while. These nuts are great to serve at any gathering – all holiday season. Then, you will want to keep them around for everyday snacking…or for throwing into your favorite recipe. So, you’ve been hanging out here for a while and getting know us (Kit and Laura) pretty well. You probably already know that I (Laura) am all about savory, while Kit handles the bulk of the sweets. Sure, I have a few baked goods that are family recipes. I might tend to pull them out occasionally, especially around the holidays. But, when it comes down to the ride or die food – it’s got to be savory. Spicy – even better. When we started talking about doing a spiced nuts recipe, of course, I was tasked with coming up with the savory spicy version. When I started working this recipe up I was actually pretty nervous about it. I really wanted these nuts to be perfect. Because everything is riding on the quality of nuts and just a handful of spices there really isn’t a lot of room to disguise a bad spice combination. I have to say these do not disappoint. I wanted to give you something a little more than just a rosemary roasted nut. I love blending my own spice mixes so I started to draw inspiration from some of my favorite combos. You should probably just double the batch right away because you might eat half of them before you have a chance to give them out or bring them to your holiday party. These nuts are a great alternative to all the holiday baked goods. Made with healthy and flavorful avocado oil instead of butter – so they’re even vegan-friendly. Bring a huge batch to work and get everyone off their sugar highs, at least for a little while. Kit, on the other hand, did, not one but two, recipes for sweeter, candied spiced nuts. She’s such an overachiever! Her two recipes can be considered ‘Sweet’ and ‘Hot-Sweet’. All three recipes are fantastic to have around, not to mention super easy to pull together. The first sweet recipe is a classic candied nut that is great on things like a pear and blue cheese salad or tart. The ‘Hot-Sweet’ recipe is a spicy sweet nut that is similar, but while also offering a bit more depth of flavor. Best of all, each of these recipes makes a great gift for the holidays. Bring them as a hostess gift or make up a batch to share some holiday cheer with your friends and neighbors. 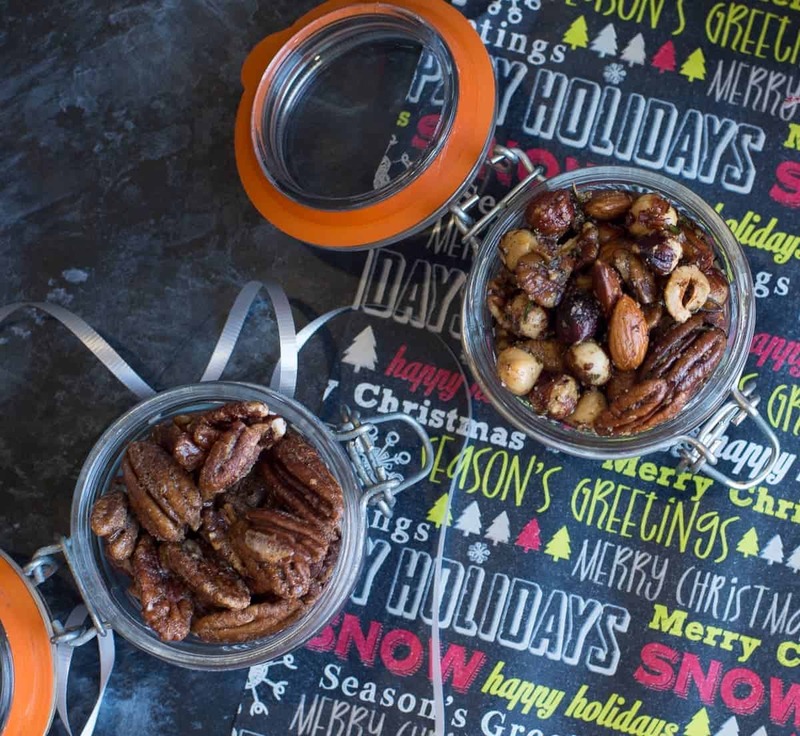 Roasted and Candied Nuts are Great Gifts for the Holidays. The perfect amount of savory spiciness. These nuts are completely addictive. Sorry-not-sorry. Roast nuts on a baking sheet for about 15 minutes. Watch closely so that they do not burn. Heat oil and spices in a heavy skillet. Add warm nuts to the warmed spices and toss well. Spread on baking sheet and let cool. You can use any combination of nuts that you like. These three are my favorite. 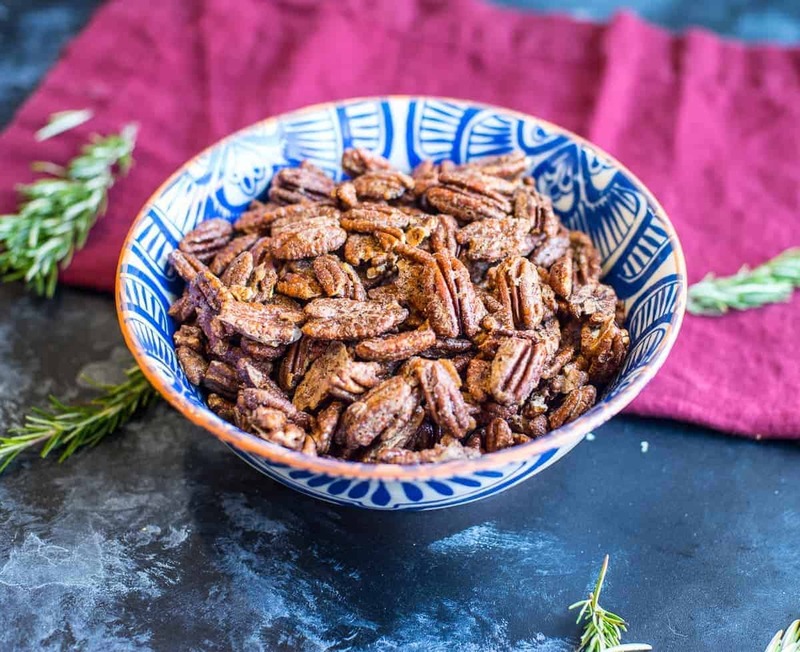 These pecans are great to have around. Toss them in salad, include them on a cheese plate, or in a bowl with dessert. Preheat the oven to 325 ℉. Combine egg white, sugar, cinnamon, salt and nutmeg. Whisk together with a fork. Add pecans (or walnuts). Toss until nuts are completely coated. Spread on a parchment-lined baking sheet. Bake until the coating is dry, approximately 20-25 minutes. Allow to cool. Store in an air-tight container. These nuts are as versatile as your imagination. Toss them in salad, include them on a cheese plate, or in a bowl with dessert. Combine the egg white, sugar, salt, paprika, and cayenne. Whisk together with a fork. Add walnuts (or pecans). Toss until the nuts are completely coated.